We’re celebrating our local egg farmers on Sunday, April 21st at our annual Spring Eggstravaganza at Hastings Park! 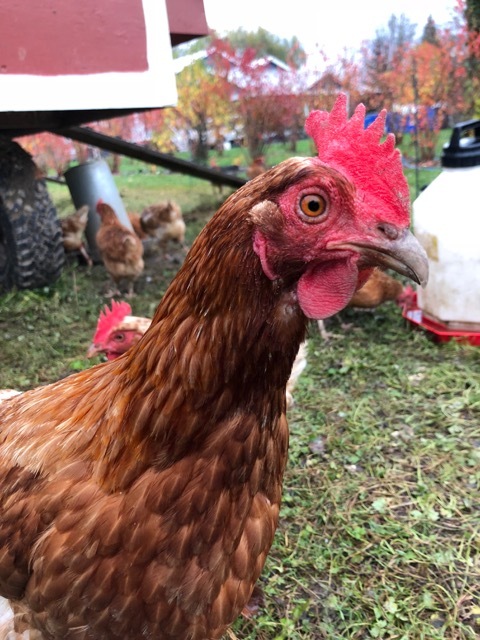 In light of this egg-citing event, we asked The Crazy Chicken Lady to share a bit about her farm so we could get to know her better. This year Hilliar Farms a.k.a. 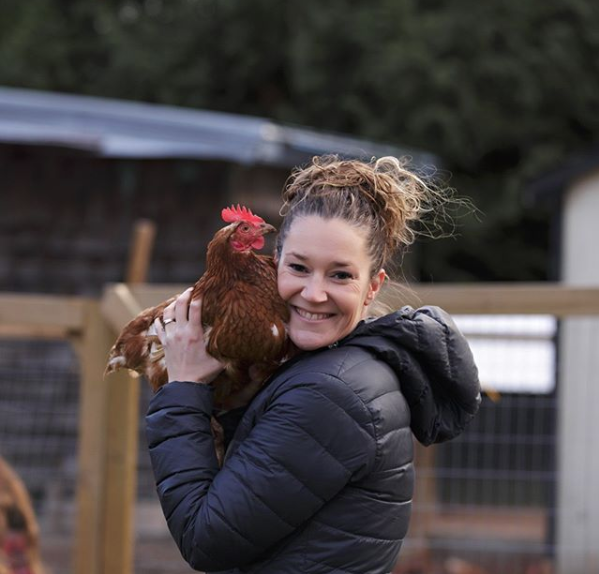 The Crazy Chicken Lady joined the VFM roster and has been a regular at the Hastings Park Market and made a few appearances at the Riley Park Winter Market. Kristin and her husband own and operate a small farm in Agassiz with their son and twin daughters. You’ll usually find Kristin and her daughter Charlie (whom shoppers have affectionately nicknamed “Crazy Chicken Lady Junior”) selling their free run eggs and ringing the market opening and closing bells. This summer, Hilliar Farms will be alternating an every other week schedule at the Downtown Market and the Riley Park Summer Market. Q: We love the Crazy Chicken Lady name! Where did you get the name? Q: How long have you been farming? Why did you choose chickens? 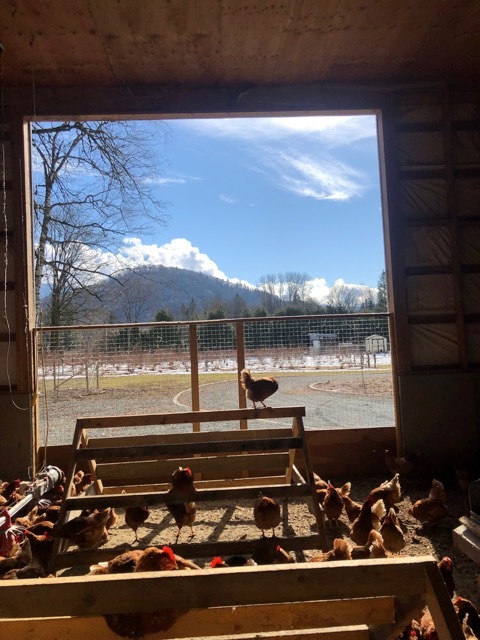 A: 4 years ago we decided to move our family to acreage (I grew up in Coquitlam and moved to Harrison Hot Springs after meeting my husband) and we knew we wanted to have a few chickens to get our own eggs and give our kids a little farming experience. I ended up buying a small chicken coop and 14 chickens off a friend. We got 14 eggs a day which was more than we could eat and I started posting on Facebook to friends and family to see if they wanted any eggs. It took off and then I needed 30 more chickens, then 50 more, then another building. The more chickens I got the more eggs I sold and I couldn’t keep up with demand. Before I knew it I had a small lot (a permit for 399 chickens from BC Egg). I really just fell in love with my chickens. Last Spring my husband and I built a barn which was ready this past October, we had outgrown both of our chicken coops. I don’t know why but as soon as we bought acreage we wanted chickens. It seemed like an easy start, relatively low cost to get setup and then we were given the opportunity from my friend to buy the first 14 along with her coop. I just fell in love with them. Chickens are a very high stress animal and I just felt they were very vulnerable so if I could make life better…I’d pick them up from the hatchery and tell them they’d won the chicken lottery because I knew they were going to be provided a great life : ) I did say I’m the crazy chicken lady right? Q: What types of chickens do you have? Can you tell us a bit about how you care for them? A: Most of our chickens are Bovans, which are brown chickens that lay brown eggs. We also have 3 heritage birds, Rosemary is a turken chicken, Mustard is a Buff Orpington, and Salt a Cuckoo Maran. My kids named the Heritage Birds.We built a large barn where the chickens run free (free range) with a huge door that we can open to let the fresh air and sun in during dry weather. In the morning at dawn we have automatic doors that open up to let the girls out to a covered outdoor run where they can dust bathe and enjoy the outdoors irregardless of weather. From there we have 3 doors that open up into the pasture where the girls can run and play in a lightly forested area where we rotate fencing to keep a fresh pasture. It’s really important to us that our chickens live their best natural life possible. In the pasture they get to forage for bugs, seeds and dust bathe, climb on branches and just be “chickens”. In the fall, we actually take all the leaves from our property and throw them in the pasture. The girls love it, their like kids jumping in leaf piles. We also have really cool “pasture wagons” that we can tow around our property that are totally self contained with nesting boxes and electric fencing run by solar power to keep the predators out. This allows us to always have a fresh pasture for them to forage in. This is why we have such an orange rich tasting yolk in our eggs. We often have people tell us that our eggs are exactly like they were when they grew up and their parents raised their own chickens to have their own fresh eggs. We are really proud of that. 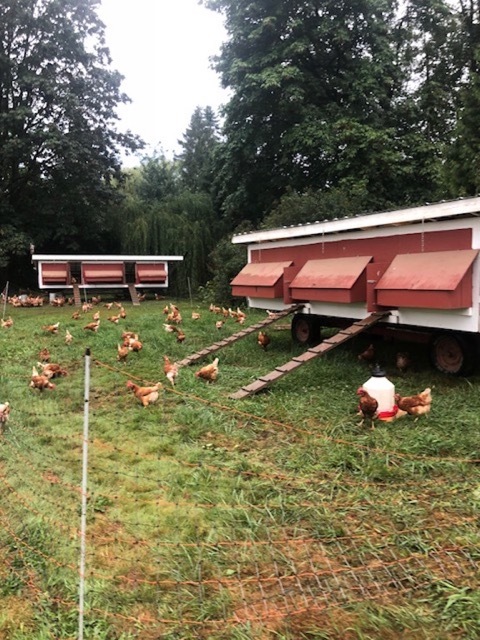 Although our chickens are not fed organic feed, which for us small lot farmers would kill us on cost, we are happy our chickens feed off of Mother Nature and are only supplemented with a non-Gmo feed. We are hoping to come up with a “soy free” feed for those with egg allergies which we are working on. Our egg quality and flavour is very important to us so that can’t be compromised. Q: What do you do when you’re not farming or at at market? Q: What brought you to the Vancouver Farmers Markets? What do you love most about VFM so far? We love VFM! I am sure many people that have come by our booth have met my daughter Charley, who has become known as this Crazy Chicken Lady Junior, she usually opens and closes the market ringing the bell. Everyone loves having the kids there and my kids have sure loved learning everything from greeting customers, talking about our chickens and our farm, handling money – you name it Charley has really taken on the role. Our favourite part is how much everyone loves coming to the market and getting to know us. I think knowing your farmer is important and everyone is so happy to be shopping and socializing, it’s not just grocery shopping, it’s much more personal and we are happy to provide locally grown quality food. It’s created relationships and that’s really important and awesome! Catch Kristin and her farm-fresh eggs at Eggstravaganza on Sunday, April 21st!